60 photos taken in 2007 and 2013 of Britain's largest preserved warship, an 11,553 ton cruiser with a main armament of 12 6-inch guns in four triple turrets and a top speed of 32 knots / 36mph. 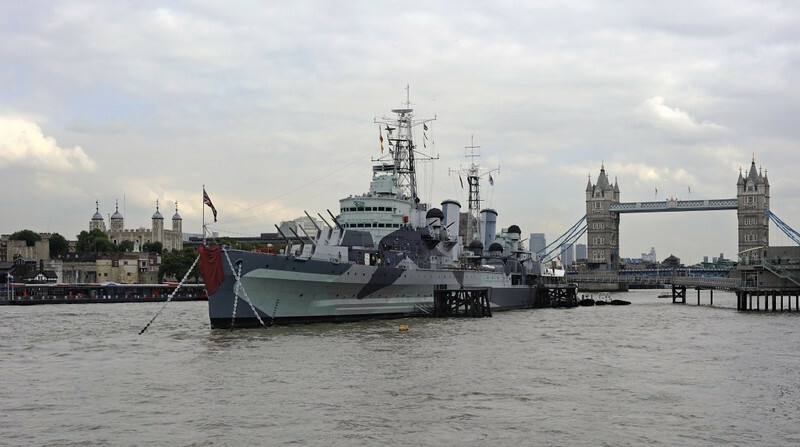 HMS Belfast, London, 3 September 2013. Belfast is Britain's largest preserved warship, an 11,553 ton cruiser with a main armament of 12 6-inch guns in four triple turrets and a top speed of 32 knots / 36mph. She was built in her namesake city by Harland & Wolff and commissioned in August 1939, immediately before the start of the Second World War. Only three months later she was very badly damaged by a magnetic mine which broke her back. Repairs took three years. In December 1943 she played a key part in the sinking of the German battlecruiser Scharnhorst during the Battle of North Cape. She bombarded German positions during the 1944 D-Day landings, and was on her way to join the British Pacific Fleet when Japan surrendered. After service in the Korean War, Belfast was extensively modified at Devonport in 1956 - 1959. She has been on display in the Pool of London since 1971. Here are ten views of her exterior.